There have been a few activities lately that reminded us of this post from awhile ago. . 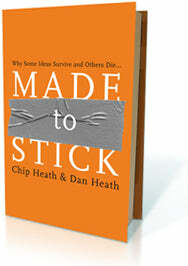 It seems timely to share our conversation with the Chip and Dan Heath again. Conversation starter: Proudly made in China: "
Chip and I have been emailing back and forth with Jeff Delkin, the owner and cofounder of a startup company called Bambu, which makes lovely housewares out of bamboo and other renewable materials. He’s said a couple of things that inspired us, and Jeff gave us permission to share them with you. That’s a really nice move — turning a legal necessity into an opportunity for dialogue, and using it even to express a sense of pride in one’s work.